Ann lives and works in East Devon since gaining her BA(Hons) degree in 3D-Design (Metal) at Brighton. She now works as a full-time designer/maker with two rural workshops, in the valley of the River Otter in East Devon. Blessed with parkland and farming views outside her workshops, and both open heathland and the Jurassic Coastline only a short walk or drive away so it’s no wonder that Nature provides her with most of her inspiration. Her work is ‘Slow Art’ with a carefully considered design process, laborious hand fabrication and finishing techniques and a close eye on sourcing materials responsibly as well as minimising waste. She works primarily in silver and gold but using copper has allowed her to create larger pieces that can incorporate a wider and bolder range of colours, two of which have been used as illustrations in Mark Runfola‘s 2014 book ‘Metal Patination Techniques for Jewellers and Metal-smiths’ (UK – Thames & Hudson). 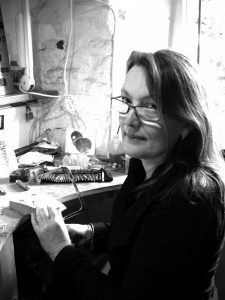 Ann’s designs are inspired by the rural landscapes of Devon and greatly influenced by the tools and techniques she uses. Sterling silver and 18ct yellow gold are her materials of choice for her precious metal designs and a wide range of designs are produced as earrings, necklaces, brooches, bangles, bracelets and rings. Heavily patinated copper is used for a distinctive range of earrings and pendants. She works at a traditional jeweller’s bench using centuries old silver-smithing and gold-smithing techniques, creating contemporary jewellery. Each item is handmade and therefore unique, much as no two fingerprints are the same.